First Line: A breeze rippled through the trees to the left and the right of the storefront. After her uncle's death, Poly Monroe takes some time off from her dress designing job at To the Nines to travel to San Ladrón. Thinking it's a simple matter of taking one last look at her family's textile store and signing some papers so she can get the place sold, Poly is surprised at how emotional she gets when she walks into Land of a Thousand Fabrics. She'd forgotten how many wonderful childhood memories are tied to this store. When circumstances force her to stay in town, Poly quickly discovers that not everyone wants her there. Her store is the last piece of property on the street that a local developer needs to make his dream come true, and other San Ladrón residents haven't made her feel all that welcome either. 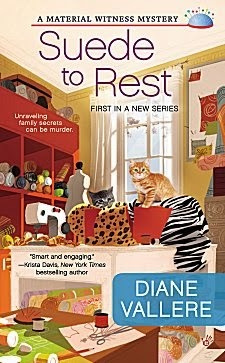 When Poly finds the body of a member of the Senior Patrol dead behind her shop, she begins to get the feeling that the man's death is somehow linked to a mystery buried in her family's past. Poly wants to make a fresh start-- and she knows she has a murder and a mystery to solve before she can get to work. Poly (short for Polyester, I kid you not) is a winning main character. Readers see her at a crossroads in her life. Up to this point, she's always settled for feeling and being safe, but now this talented woman with a sharp eye for design and a good sense of humor is ready to embark on something new. That something new seems to be bringing Land of a Thousand Fabrics back to life, and Poly is sharp enough to know that she won't be able to bring it back exactly the way it used to be. To survive, Poly is going to have to make changes, and I have to tell you that I'm really looking forward to seeing what they are. The hook in this Material Witness series is fabric, and in Diane Vallere's skillful hands it's a hook that excites yet doesn't overpower the mystery. Poly looks at fabric the same way I look at yarn, so I felt a strong kinship with the character on that point (and others). To take her mind off all the things that had gone wrong, one night Poly got an idea to spruce up a new friend's business. She spent hours with fabrics and trims, and by the time she was finished, she had a treasure trove of goodies. I was downright disappointed when she never had a chance to deliver the things she made to her friend. I'm hoping to see her reaction in book two! The secondary characters are also a strength in Suede to Rest. It's refreshing to have a main character whose parents aren't chock full of neuroses. San Ladrón is a small town filled with characters. The Senior Patrol is a group of retired citizens who patrol the streets at various times throughout the day to make sure no one's up to any hanky panky. In this first book, their role appears to be that of gossip mongers rather than crime busters because plenty happens that they don't seem to see. Yes, San Ladrón does have a bit of an edge. All the residents don't welcome Poly with open arms, but she does make friends like the Lopez family who own and operate a local bakery. Although I did find the killer to be rather easily guessed, Vallere has laid a solid foundation for her series with a strong setting, a cast of fascinating characters-- and a fabric store I'd love to spend some money in once it's cleaned up. Bring on book two! Cathy - I do like the premise here. And it does sound credible that a store like that would need some changes. It also makes for a solid bridge to the next story in the series. Oh, and as an aside, did you know that San Ladrón can be translated from Spanish as 'Holy Thief?" Thanks for the translation! I meant to look it up and had forgotten to!